September 19th be International Talk Like a Pirate Day! Capt. Rob reports on the hurricane from the safety of "evacucation." 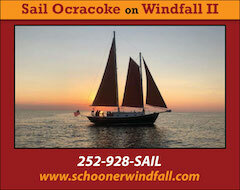 Ocracoke's Skipjack Wilma Lee returns to Chesapeake Bay. Just Ridin' Around – Get In! Eight boats lit up Silver Lake in the Harbor Lights Boat Parade! Ocracoke Alive is looking for a new home for its historic 77-year-old Chesapeake Bay Skipjack, Wilma Lee. Once again, we celebrate International Talk Like a Pirate Day! Ocracoke gets ready for a hurricane. ...and now for the Main Event!